Every year a major new version of iOS is released, adding a wealth of powerful improvements that transform the way we use some of our most important tools in life. In comparison to updates in recent years, iOS 12 – which Apple introduced at today's WWDC keynote – doesn't have as many flashy new features or major changes to system apps. When it gets in public hands this fall, lots of users may install it and not notice anything different. And that's partly on purpose. Apple spent a lot of time this year focusing on performance improvements that make iOS run better on a wide assortment of devices. In iOS 12, even though your iPhone or iPad may not be getting a major Home screen redesign or anything similarly noticeable, one change Apple hopes you will recognize is that your device runs better than ever before. In addition to being available on all the same hardware as iOS 11, iOS 12 claims to bring a Camera that opens up to 70 percent faster from the Lock screen, apps that launch up to twice as fast, smoother animations system-wide, a keyboard that loads up to 50 percent faster, and more response typing. These may not be the kind of details that make for great marketing campaigns, but they make the tasks we do every day better. It's not fair to call iOS 12 a release mainly focused on fixing bugs and improving performance, however. 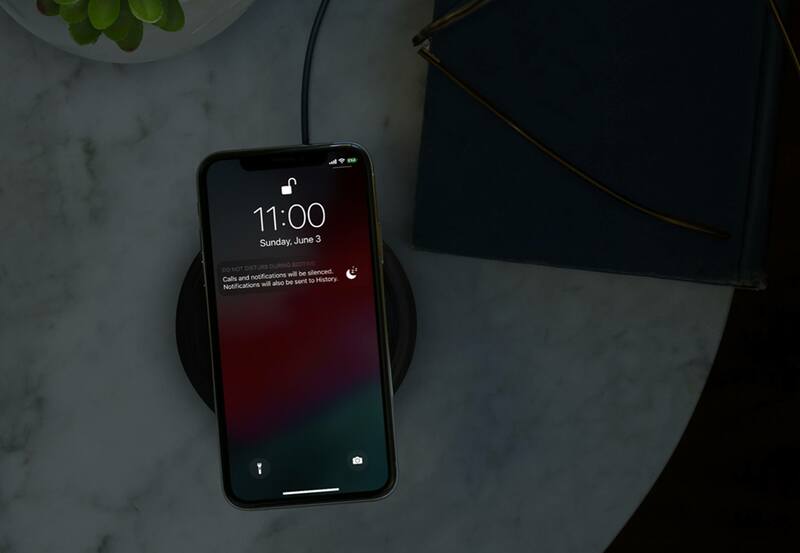 Apple has also put together an impressive assortment of features, big and small, which will empower you to do things with your device that wasn't previously possible. There are impressive new automation capabilities integrated deeply with Siri, improved tools for monitoring how you use your devices, excellent new features for Messages, FaceTime, Photos, and more, and the arrival of ARKit 2. Here's an in-depth look at all that iOS 12 will bring when it launches this fall. A little over a year after Apple's acquisition of the Workflow team, we now know exactly what that team has been busy with: Siri Shortcuts. Siri Shortcuts is the branding that encompasses several new Siri features and a brand new app, all of which help make Apple's digital assistant a true aid in productivity. This starts with a new API that enable all third-party apps to integrate with Siri, even if there's no dedicated SiriKit domain to match their app type. Apps using the new Shortcuts API will be able to expose quick actions to Siri that are tied to a user-set phrase. For example, you'll be able to set up a Siri quick action inside your favorite shopping app to activate voice ordering of your regular grocery order. This quick action can be triggered in the most natural way possible: using a custom phrase that you set up, such as, "Order the groceries." Actions you take using a custom phrase completely bypass the need to specify which app you want to use, unlike current SiriKit apps. Just tell Siri the exact words of your pre-set phrase, and it will execute the programmed action for you. Once iOS 12 launches, apps that integrate with SiriKit in this new way can use an in-app 'Add to Siri' button to help users take advantage of Siri Shortcuts. Shortcuts can be as simple as a single action, but you can also create complex multi-step workflows that will run when you give Siri the appropriate command. Multi-step actions can be created inside Apple's new Shortcuts app, which will launch on the App Store alongside iOS 12. 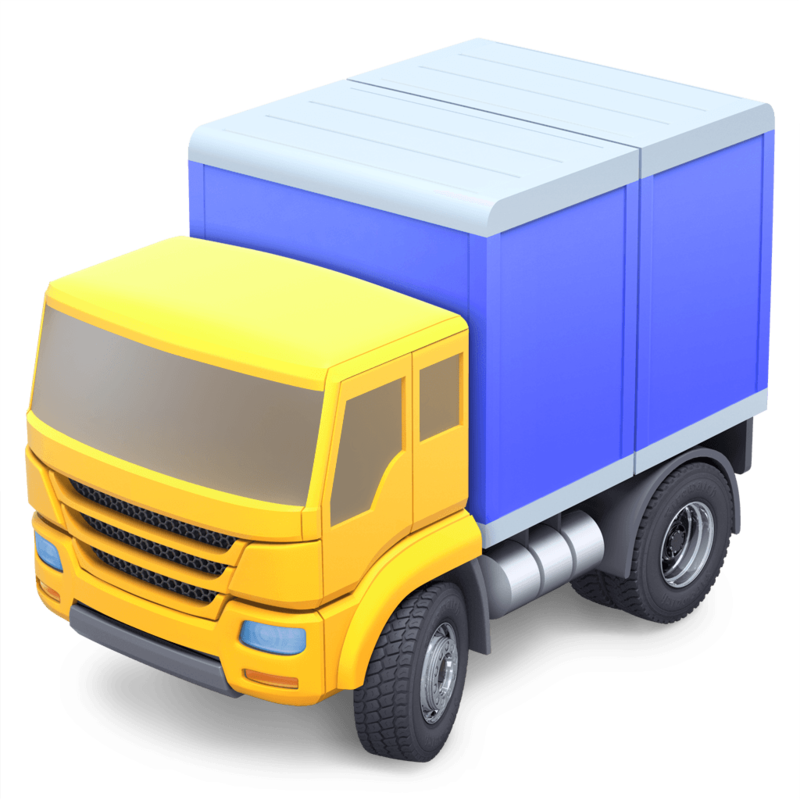 The Shortcuts app bears a strong resemblance to Workflow, with the ability to thread together strings of actions from different system and third-party apps that will execute in sequence. Shortcuts you’ve created live in the app’s Library tab, and you can discover and save Shortcuts built by Apple’s team from the Gallery tab. One major improvement of Shortcuts compared to Workflow – besides the likely additional system integrations Shortcuts will include – is the activation method: no matter how complicated a shortcut is, all you have to do to run it is tell Siri the custom command you set up. The digital assistant will then immediately perform all actions in your shortcut, one after the other. This new voice-activated productivity will be available for Siri on iOS, watchOS, and the HomePod. And for the times you’d prefer not to use voice, another quick option for triggering shortcuts from the app is through its included widget. 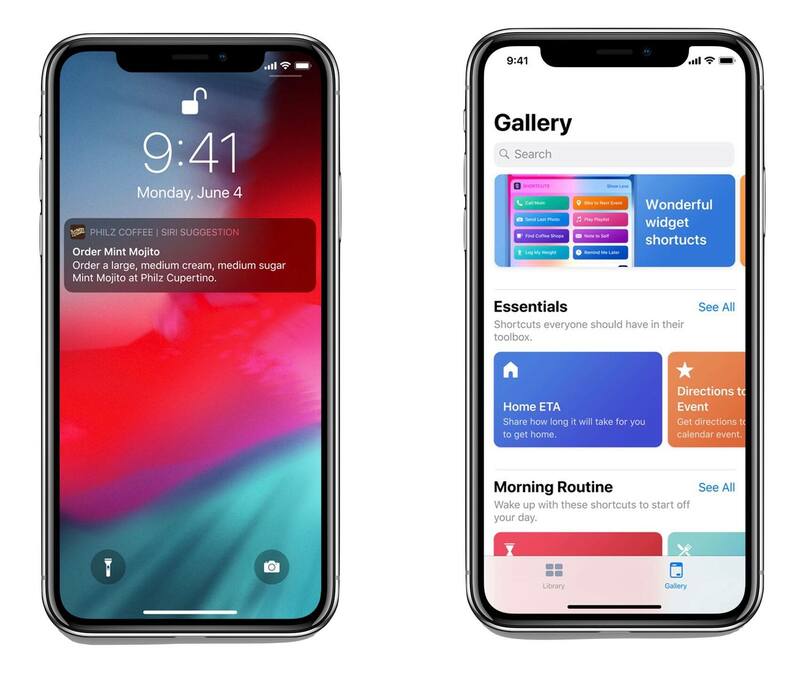 Joining the Workflow-like aspects of Siri Shortcuts, Siri will now make more intelligent recommendations for actions you need to take, both from the Lock screen and inside the Siri Suggestions widget. If you have a habit of opening a certain app and taking a particular action at regular times, Siri will begin surfacing silent notifications on the Lock screen that serve as shortcuts to initiate those actions. These look largely the same as standard notifications, except they receive a nice dark UI to differentiate them. Also, in cases where, for example, you’re running late to a meeting, Siri can add intelligent options to the Siri Suggestions widget for messaging someone your ETA, or pulling up navigation in Maps. Siri Shortcuts is undoubtedly Siri's most exciting new feature in iOS 12. As has been true in many prior updates, however, the assistant has also been upgraded with a few new areas of knowledge. Food knowledge lets you ask about the number of calories in a food item, racing fans will enjoy Siri's new motorsports knowledge, there's a wider array of celebrity trivia facts available, and Siri can also now help you find a password stored in iCloud Keychain. 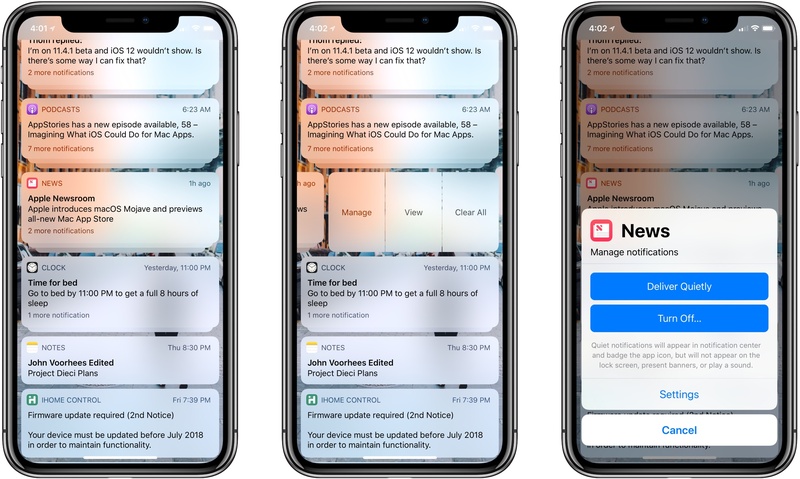 Under the banner of helping users gain more understanding and control of how they use their devices, iOS 12 introduces improved features for Do Not Disturb and notifications, alongside a brand new area of analytics and monitoring controls called Screen Time. Visiting the Do Not Disturb section of Settings doesn't reveal many changes to the feature. In fact, there's only one: a toggle to turn on Bedtime Mode. When this new mode is activated, notifications that come in while you're asleep won't appear on the Lock screen. This way, if you wake up in the middle of the night and grab your iPhone to check the time or quickly do something in an app, you won't first be confronted by the demands of the outside world. With Bedtime Mode toggled on, in the morning the first thing your iPhone will show is a 'Good Morning' screen with a little info about the weather. You can then choose to hit a button, in your own timing, which reveals all of the night's notifications. The latter option will only appear if you're in the middle of a scheduled calendar event. While these improvements aren't as extensive as some users may hope for, they certainly make the feature more powerful than it was before. In iOS 12, it feels like Do Not Disturb finally understands the types of situations people want the feature for in normal day-to-day use. One of the biggest problems with notifications has been solved in iOS 12: all notifications are now automatically grouped together by app. Your notifications for each app are grouped in a way that resembles a stack of cards, and you can tap on a stack to view each individual alert. This frees up space on your Lock screen and enables easy triage: with a single tap, all notifications from a certain app can be dismissed at once. If you'd like to disable grouping, that can be done on a per-app basis. The second noteworthy new feature with notifications is called Instant Tuning. This enables changing notification settings for an app without needing to open the Settings app. You can access Instant Tuning by swiping left on a notification and hitting the new 'Manage' button. Here you'll find options to turn off that app's notifications, open Settings, or have your notifications delivered quietly, which means they skip the Lock screen and don't show banners, instead going straight to Notification Center. Finally, there's a new type of notification in iOS 12 designed for critical information. This opt-in alert will notify you even when Do Not Disturb is engaged. One use case Apple mentions for this feature is getting important reports from your healthcare provider, but it's unclear if these new 'critical alerts' will be limited to certain app types, or if any app will be able to take advantage of them. Screen Time is a new assortment of tools designed to help users keep track of the way they use their devices. Inside iOS 12's Settings app, a new Screen Time section contains a host of data points regarding how your iOS device has been used recently. The first thing you'll see in Screen Time is an overview of how much you've used your device that day – a total use time is displayed above a breakdown of how that time was distributed among various apps and app types. Tapping into this data shows a more detailed breakdown of both the current day and the last seven days, with in-depth statistics on how many times you've picked up your device that day, how many notifications you've received, and more. It truly is an extensive deep dive into the way you use your device – and looking at my data so far has been eye-opening. This activity information is joined by new tools for managing how you use your device. You can schedule yourself downtime, during which time only apps you've pre-approved can be used. Also, time limits can now be set for apps; iOS will notify you when that time limit is drawing near, then provide a screen-filling notice when time's up. One nice detail is that these Screen Time features use iCloud to sync across devices, so you don't have to set them up separately on both iPhone and iPad. Screen Time's tools can be great for personal use, but they'll especially be a boon to parents. If you use iCloud Family Sharing as a parent, you'll have an informative overview of exactly how your child is using their device, and you'll also be able to approve requests for additional screen time your child requests. One nice feature of Screen Time is that you don't even have to open Settings to benefit from it: users will receive a weekly notification giving them a summary of their week's device activity, which can then be tapped on to view more data in Settings. One of the strengths of the Apple ecosystem is Apple's two powerful messaging platforms: iMessage and FaceTime. iOS 12 brings improvements for both. Apple isn't letting the Animoji train slow down in iOS 12. Facial tracking for Animoji has been expanded to include tongue detection, so you can send fun messages to your friends featuring, for example, the Unicorn's sparkly purple tongue. There are also new Animoji characters: Ghost, Koala, Tiger, and T-Rex. But perhaps the biggest Animoji news is the addition of something Apple calls called Memoji. Memoji is a new Animoji type that can be customized to look just like you. This is made possible thanks to a wide assortment of options for modifying skin, hairstyle, head shape, eyes, brows, nose & lips, ears, facial hair, eyewear, and headwear. It's truly impressive the depth of customization made possible here. What's also neat is that you aren't limited to a single Memoji; you can make as many new characters as you'd like. 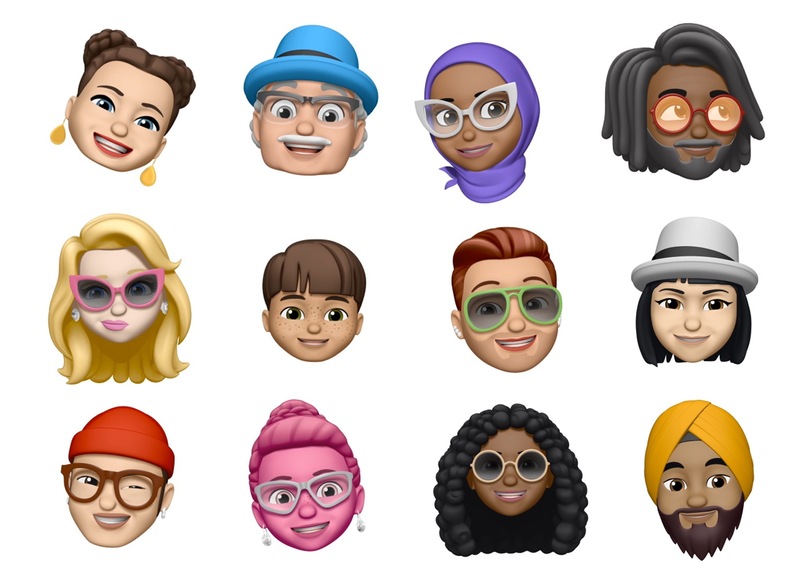 And once you're ready to record a video with your Memoji or another Animoji, you'll be happy to find that recorded messages can now be up to 30 seconds long, an extension from the previous 10-second limit. Photos is now an iMessage app in iOS 12, which frees up the Camera icon to take you straight into the full viewfinder upon a single tap. This is important because the Camera in Messages has a new effects menu, accessed by tapping the star icon in the lower-left corner of the screen. Here you'll find the option to overlay an Animoji on top of your face in real-time, add stickers from an iMessage sticker pack, add text, a filter, or one of several other markup tools. Many of these options seem to have been inspired by Apple's Clips app, and they're a great fit inside Messages. FaceTime has long been a favorite feature for Apple users, but it's unfortunately received very little development attention from Apple over the years. That changes this year, as iOS 12 introduces Group FaceTime. Group FaceTime goes big by enabling a whopping 32 simultaneous participants on a call. This huge number of people could easily become a UI mess, but Apple appears to have found an elegant solution: each member of a call has a square video tile that dynamically resized based on their participation in the conversation. If someone hasn't spoken recently, they'll probably be in the roster of tiles arranged horizontally along the bottom of the screen; recently active participants, however, will be visible front and center in either a large or small tile, depending on when they last spoke. Every time someone begins speaking, their tile resizes so you can focus on the right person at the right time; if you'd like, you can also double-tap a person's video tile to bring them to the forefront. The UI for Group FaceTime looks fluid and beautiful – a clean, organized way to keep track of group conversations. 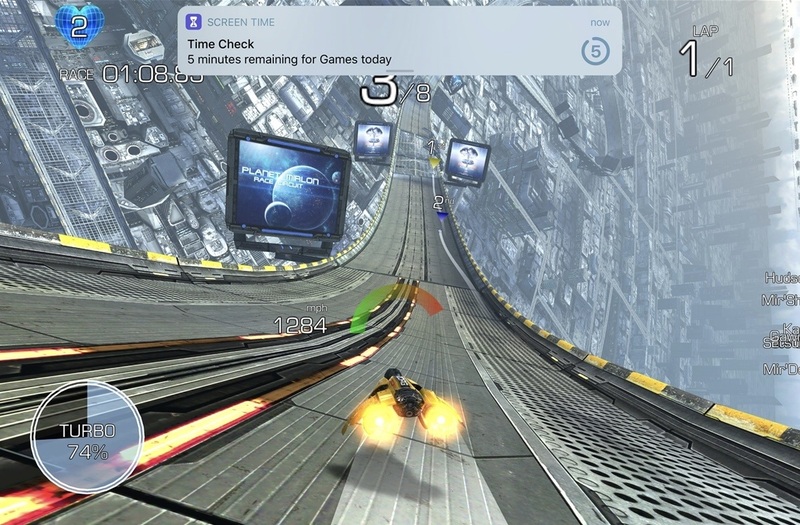 The feature works on iPhone, iPad, and even the Mac. You can also take group audio calls on Apple Watch. 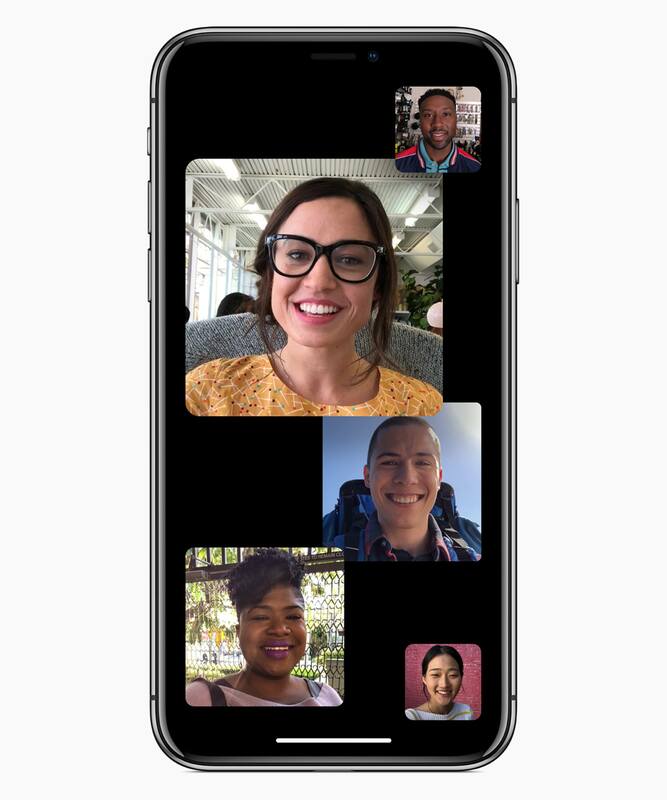 Getting one new feature would have been enough to satisfy regular FaceTime users, but iOS 12 also includes all of the new special Camera effects found in Messages, so you can overlay stickers, Animoji, filters, and more on to your video feed. Rounding out FaceTime improvements, you can now initiate a FaceTime call straight from the Messages app. Inside any of your Messages threads, tapping the contact's name at the top reveals a new menu that includes the option to start a FaceTime call. This works both with individuals, and with threads containing a group of contacts. 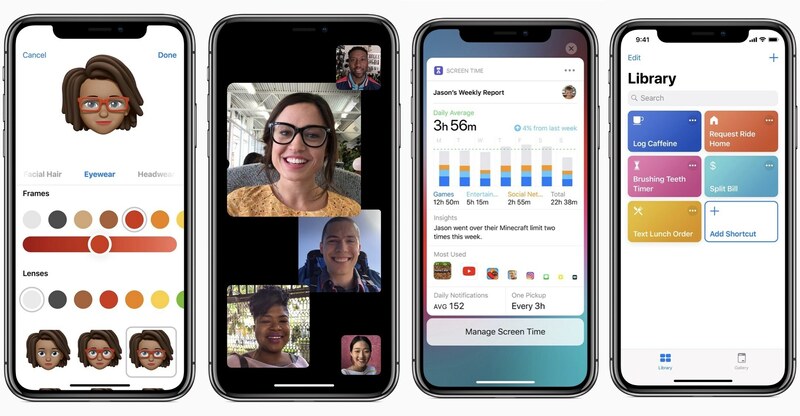 Joining Messages and FaceTime, a number of system apps have been updated in iOS 12 in both big and small ways. Navigation in the Photos app has been revised: gone are the Memories and Shared tabs, replaced by a new For You tab that consolidates both former tabs, and a new Search tab that's home to an improved search experience. For You in Photos is a nice place to experience surprise and delight in the form of new Memories and Featured Photos, the latter of which is brand new and contains things like 'On This Day' highlights. You'll also find activity for all shared albums inside For You, and suggestions for sharing and Live Photo Effects that can be added to your images. Sharing Suggestions are an exciting addition in iOS 12: Photos will intelligently identify people in your photos who are in your contacts, and suggest you send them any images from an event you were at together. Unlike with shared albums, all photos shared through suggestions are sent at full resolution. The really nice thing about Sharing Suggestions is that, once a friend receives your shared photos, their own library will be scanned to see if they have any images from the same event, after which Photos will suggest they share those photos with you. It's a clever addition that will help make photo sharing more ubiquitous, even among those who would never otherwise take the initiative to share. Search in Photos has received a big upgrade here too: visiting the new Search tab will surface suggestions for different events, people, places, categories, and groups of people, and typed searches can now consist of multiple search terms. You can also now search by business name. 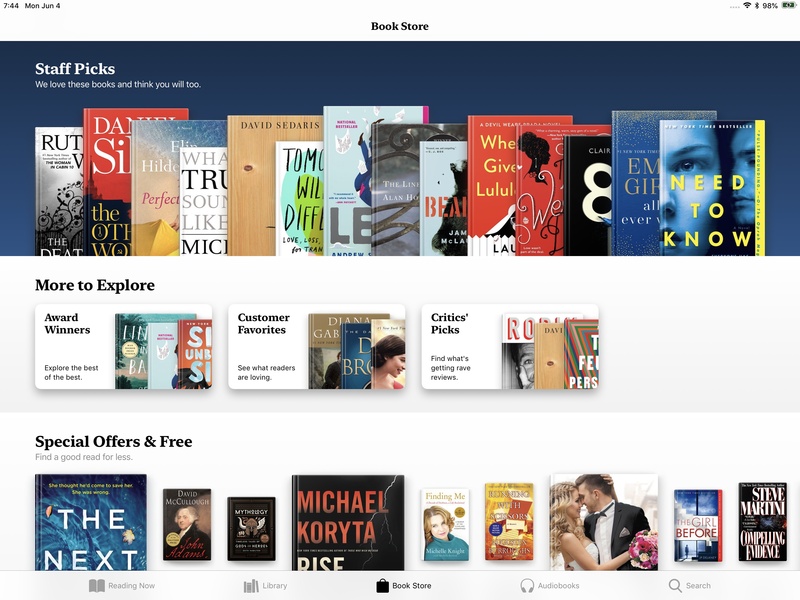 iBooks is getting a major redesign in iOS 12, following in the footsteps of Apple's other media and store apps like Podcasts and the App Store. The new app's Reading Now screen consolidates all the books you're currently working on reading, and also has a section called Want to Read, in addition to recommendations of new books to check out. Books can manually be marked Want to Read or Finished, Goodreads-style. The app's remaining four main sections are Library, Book Store, Audiobooks, and Search. Everything in the app has received a fresh new look, with beautiful graphics and widespread use of a distinctly un-iOS-like serif font. The one part of Books that remains largely untouched is the reading experience itself; the only change I've discovered is the presence of a true dark theme for the iPhone X. Measure is a brand new built-in iOS app that takes the power of ARKit and uses it in a practical tool that can benefit users on a regular basis. The app is extremely simple, offering up the ability to measure items and function as a level. There are nowhere near as many options as those found in third-party alternatives like MeasureKit, but that's probably for the best in an app that feels like Apple's attempt at an AR demo for the masses. 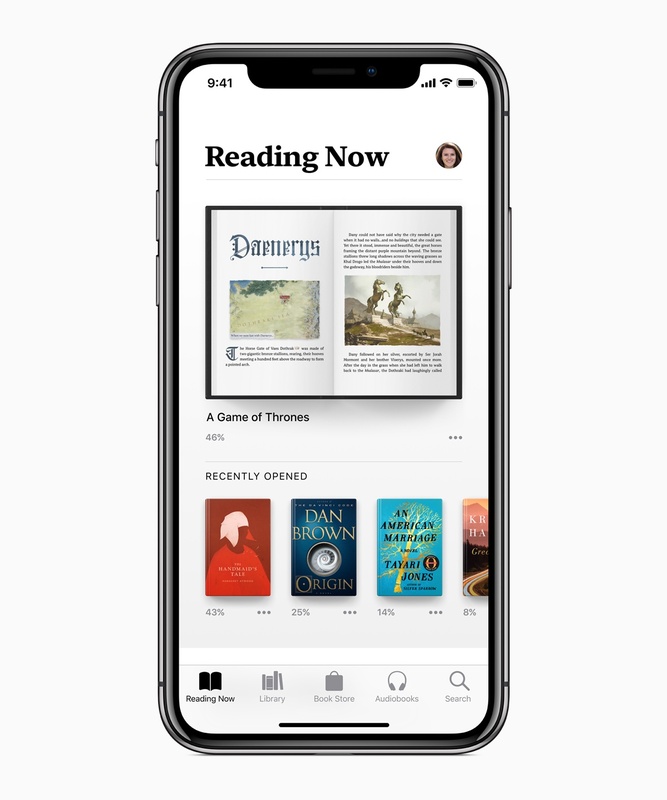 Apple News joins Books and Photos as another app with redesigned navigation in iOS 12. There are only three tabs now: Today, Spotlight, and Browse. The former is a rebranding of For You, Spotlight remains the same, and Browse consolidates the previous Following, Search, and Saved screens all into one. I should have mentioned: that's the iPhone version of News I just described. On the iPad, there's a new left sidebar that removes the need for tabbed navigation altogether. This sidebar lives next to the main grid of news stories and contains a full listing of channels you follow, as well as Spotlight, search options, and more. 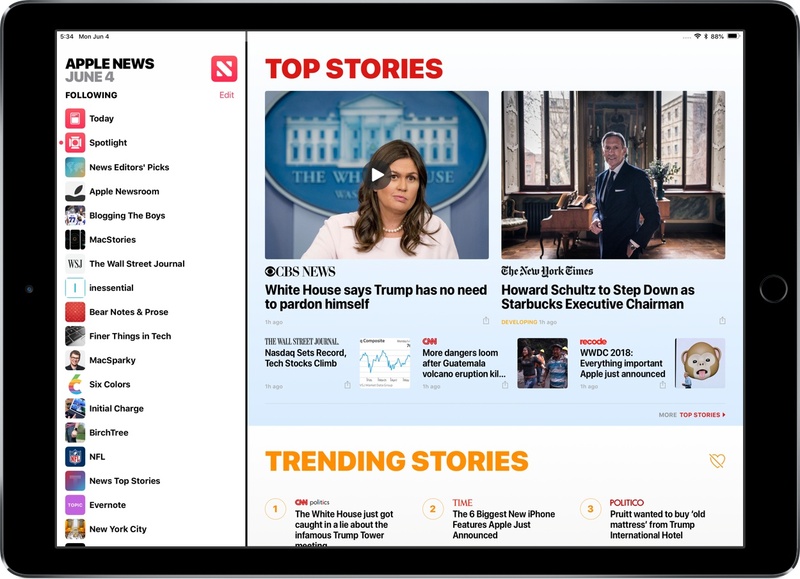 It's a beautiful use of the iPad's extra screen real estate, and makes it far easier than before for you to go straight to a news source you love. Two under-appreciated iPhone apps are getting some love in iOS 12. Stocks has received a ground-up revamp that looks great and brings the app to the iPad for the first time. 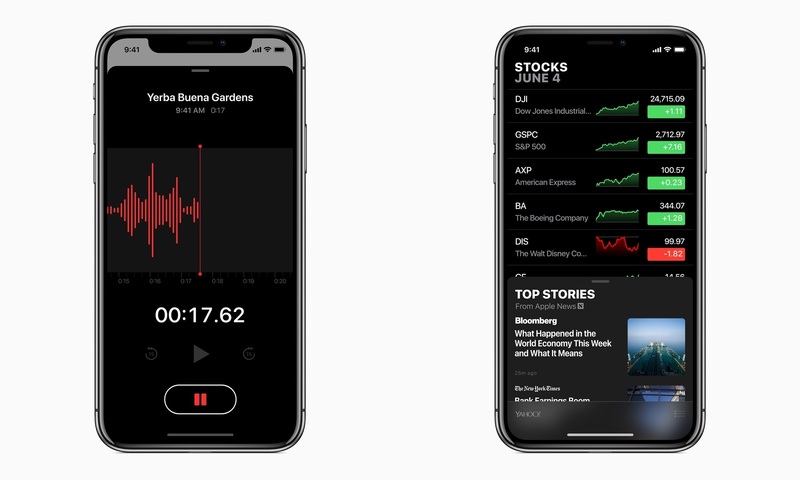 One of the hallmark features of the new app is its integration with Apple News, populating business-related articles inside the app that you can view without leaving Stocks. Voice Memos has also been given its first iPad version, aided by the addition of iCloud syncing. Safari across iOS and macOS is being equipped with new privacy-related features that block user tracking methods commonly employed by popular comment widgets and social media buttons across the web. Also, when users browse the web in Safari, Apple will show websites a simplified array of metadata that will make it harder for sites to employ tracking via system configuration. A new option in Safari's settings enables activating favicons in tabs, a great way to quickly identify which tab is which – particularly when you have so many open that the text is truncated. While there aren't any immediate user-facing changes to the Health app, Apple announced today that a new Health Records API is being opened to developers. This new API builds on the Health Records feature introduced in iOS 11.3 earlier this year, and enables third-party health apps to add data types to Health Records like medication tracking, disease management, and nutrition planning. For users whose healthcare providers have adopted Health Records support, this will enable a more seamless handoff between data logged in third-party apps and the broader Health ecosystem. Apple continues to invest a lot of resources into building its AR platform of the future. 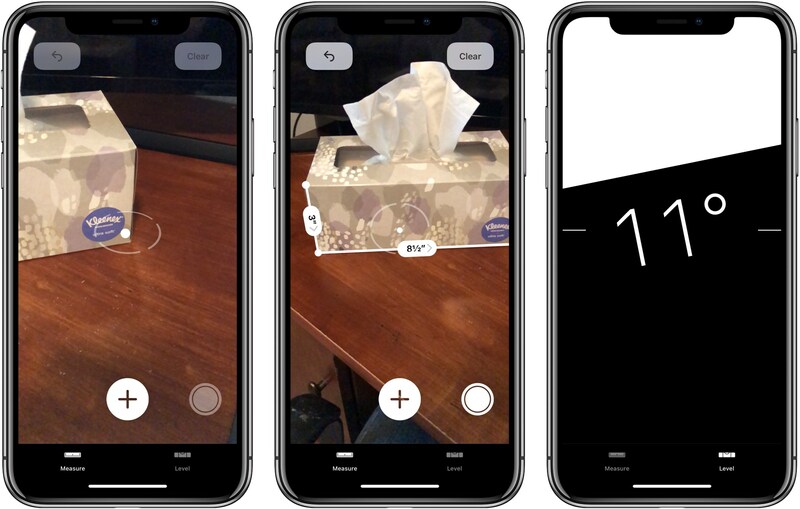 ARKit 2 brings significant improvements to the year-old developer framework, adding improved face tracking, more realistic rendering, and 3D object detection. 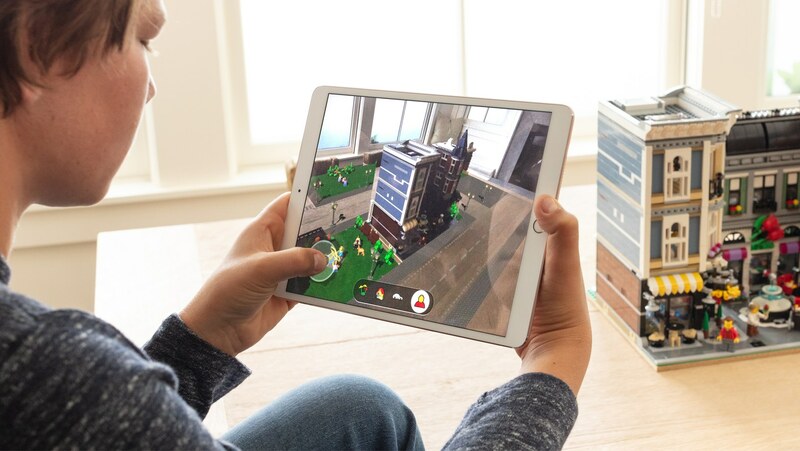 The latter was used in a demo on-stage to show a real-world LEGO building being complemented in an AR app by characters and additional scenery that provided a new playground for users. The improvement in ARKit 2 that I'm most excited about is the ability to provide persistent AR experiences. This means that objects you interact with in AR can remain in-place across multiple sessions of using the app, rather than disappearing and needing to be rebuilt and reconfigured in every new session. The final big change in ARKit 2 is what Apple calls Shared Experiences. Thanks to this new feature, multiple people using multiple devices can interact together in the same AR world – perfect for multiplayer games, but also potentially for creating shared environments for laying out furniture in an app like IKEA Place. One other AR-related announcement Apple made is the introduction of a new file format, USDZ, which was created in collaboration with Pixar and is optimized for augmented reality. USDZ assets will be identified in Apple's apps with a special symbol – Apple demoed this by showing a USDZ preview of a guitar on Fender's website in Safari, which could then be viewed in the real world using AR. Among developers featured on-stage, Adobe pledged to offer native support for USDZ in its Creative Cloud suite of apps, so images, video, and text created in those apps could be brought seamlessly into a native AR environment. iPad Gesture Changes. Ever since the iPhone X was released last fall, it's been difficult going back and forth between the iPhone and iPad because each device has had an entirely different set of gestures for things like opening the app switcher, Control Center, and more. In iOS 12, the iPad's gesture system is being revamped for the second year in a row, and it's all for the sake of bringing unity with the iPhone X: iPads running iOS 12 now have the exact same gestures as the iPhone X. Control Center has been moved out of the app switcher, now residing in the top-right corner of the screen. Swiping all the way up from the bottom of the screen takes you back Home, and you can open the app switcher with a swipe up, then pause. Having only one set of gestures to remember is great. What's not so great is that this move means Apple is doubling down on keeping Control Center in the difficult-to-reach corner of the iPhone X's display. CarPlay for Third-Party Navigation Apps. Long overdue, Apple is enabling third-party navigation apps like Google Maps and Waze to integrate with CarPlay. This means those apps will get all the benefits of Apple Maps on your car's in-dash screen. Security Code AutoFill. Whenever you receive a two-factor authentication code via SMS, iOS 12 will identify the code and cause it to appear as an AutoFill suggestion. Thanks to this small feature, you'll no longer need to open the Messages app to first copy a two-factor code before logging into an app or service. Password Manager API. One advantage Apple's own iCloud Keychain has had over third-party password managers like 1Password is that it can populate relevant account info inside the QuickType keyboard. That level of convenience is hard to beat, no matter how much more full-featured third-party apps may be. Fortunately, in iOS 12 a new Password Manager API will enable the same type of feature to be adopted by third parties. Built-In Thesaurus. An addition to the built-in collection of dictionaries in iOS is an American English thesaurus, which, once installed, will enable viewing a word's synonyms from directly inside the Look Up screen. Face ID Alternative Appearance. When Face ID launched last year, one major limitation compared to Touch ID is that only a single user's face could be stored for recognition. In iOS 12 it appears that may be changing: there's now an option in Settings to set up an 'alternate appearance' for Face ID. This feature is seemingly being pitched as a way to improve Face ID recognition for a single user, but in theory it's possible it could be used to add a second person's face to the recognition system. iOS 12 leaves a lot of feature requests unanswered. There's very little for iPad fans to celebrate this year, and long-neglected apps like Reminders have remained untouched. However, despite all it doesn't do, there are plenty of improvements here that move the platform forward. Siri's usefulness – reliability issues aside – has historically been hampered by its limited abilities. Siri Shortcuts are an exciting fix to that problem, opening up a world of Workflow-like possibilities with the aid of a user-set syntax. Changes to notifications and Do Not Disturb, while not revolutionary, are nonetheless valuable improvements that will benefit our daily lives. The myriad of changes to system apps is just as we've come to expect from a new version of iOS. And even ARKit 2 – which I'm still not convinced will convert me to a regular user of AR apps – helps bring us one day closer to a time when immersive AR experiences can become the norm (with the help of some future hardware products). If an iPhone or iPad is a core computer in your life, iOS 12 will almost certainly make your experience with that device better. It may not be as impressive a release as some of its predecessors, but if Apple delivers on its promise of focusing on performance, and throws all these new features in too, it will be a release we're all happy to update to.